A stone wall provides strength and beauty to your landscape. It can create terraces for gardening while replacing old shrubs or grass as a means of preventing erosion. Over time your wall can become dirty and stained. It is important to properly maintain and clean a landscape stone wall so that it doesn’t lose its luster. There are several options for cleaning a stone wall. 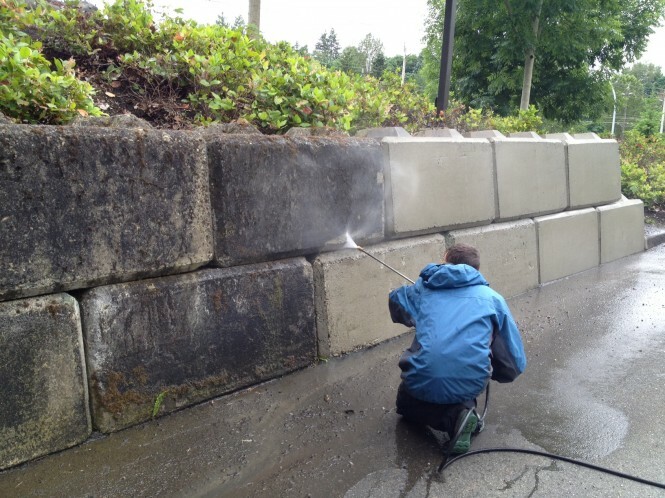 Here’s how to keep a stone wall clean by pressure wash retaining wall. Before you start washing the wall, remove any pointing or render on the stone wall with a hammer or air compressor. The best way to clean a stone wall with a pressure washer. You can rent, borrow, or buy a pressure washer to complete the task. Stand away from the surface of the wall so you can get an idea how the washer works before you begin the job. You can move closer to the wall to ensure it gets thoroughly cleaned. Start at the top of one section of the wall and work your way down. The best method is to use a continuous movement, going slowly across the length of the wall down toward the bottom of the stone. Stand back after you have washed the stone wall, and go over the entire wall a second time. Washing the wall again will remove any remaining debris from the surface. Start at the top and move the spray of water down as you move along the wall. If you don’t want to use a pressure washer, or the wall is not extremely dirty, you can use a garden hose to wet the wall and then scrub away the debris using a stiff brush or broom if you have a large wall to clean. You may have to scrub and rinse several times before the wall becomes completely clean. A retaining stone wall is a stunning addition to a property line because it adds value to a home’s worth. Whether it is secured with mortar or securely stacked, a stone wall sharply defines your home’s garden landscaping.